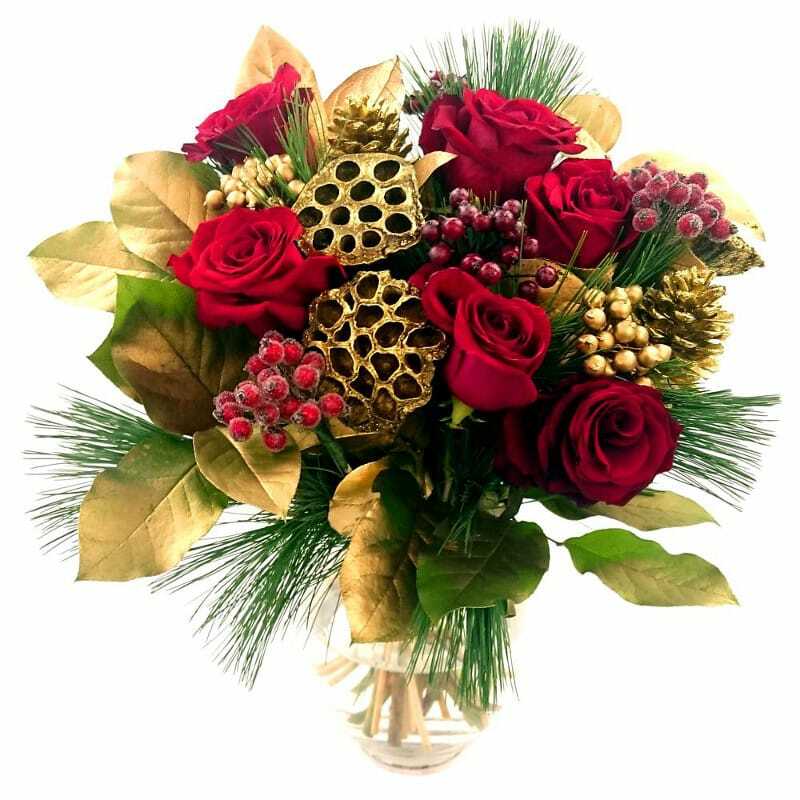 Get into the spirit of the season with our wonderful Traditional Festive Cheer Bouquet, a breathtaking arrangement comprised of the finest premium grade red roses surrounded by gold lotus heads, glitzy pine cones, and red and gold berries. Lovingly arranged by hand courtesy of our team of expert florists, this elegant arrangement will spread seasonal cheer wherever it goes. 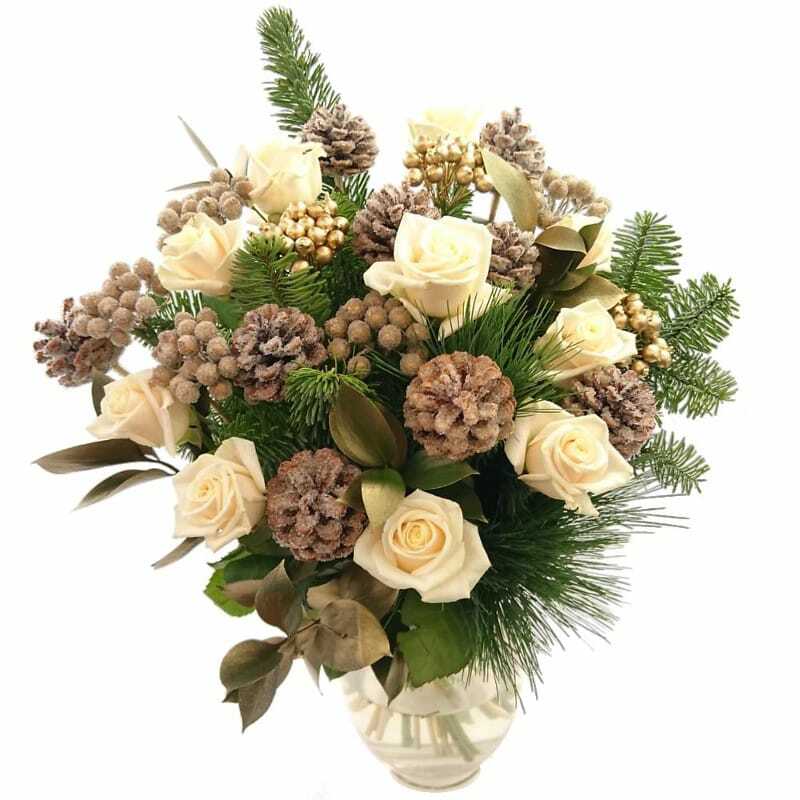 The Luxury Winter Wonder Bouquet features a beautiful selection of the freshest high grade off-white coloured roses presented with frosted pine cones and glitzy gold berries. This bouquet is then beautifully finished off with some fresh festive greenery, a perfect finishing touch. Our delightful festive bouquets are ideal for complementing your existing seasonal decorations - an arrangement of festive flowers would look sublime poised in the centre of your dinner table on Christmas day or on the mantelpiece amidst your Christmas cards. Alternatively, you could send one of these delightful bouquets to a loved one as a unique and memorable Christmas gift. Or maybe you want to thank a relative for hosting Christmas dinner by arriving with a bountiful bouquet of fresh Christmas flowers. Whatever the reason, our Christmas Flowers range is sure to have something to suit with an array of beautiful bouquets that are guaranteed to impress!